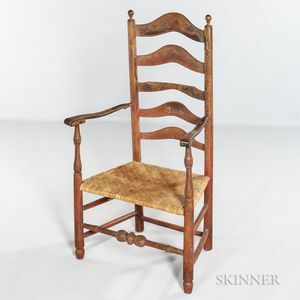 Red-painted Slat-back Armchair, probably Delaware River Valley, 18th century, with five reverse-graduated splats, shaped arms with flat handholds, turned arm supports and bulbous front stretcher, old surface, (imperfections), ht. 44 1/2, seat ht. 15 1/2 in.